It can be a little frightening to see someone having a panic attack, especially if it’s the first time you’ve seen one. How do you know what to do? Is there any way you can help the person? Find out more information about dealing with someone’s panic attack here. Most people are well-acquainted with smart phones, but few realize how their mobile gadgets can be used to help combat anxiety. A new game for use on cellular phones may help people to recover from a panic attack or relax before it can begin. Find out how the game works here! After being in an extremely stressful situation, some people go on to develop panic disorder. For one woman who was released after having spent time in jail for a widely reported murder, panic attacks have become a part of her life. Read about it here. Having a panic attack can be a scary experience, but it’s important that you continue to live a rich and fulfilling life in spite of your fears. 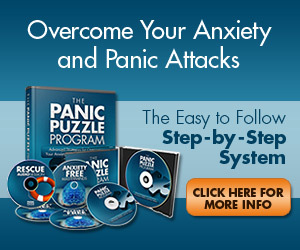 Find out how to take some steps to keep your panic at bay. Because of cultural norms, many people pressure men to be overly tough and strong. This can make it difficult for men to talk honestly about how they are affected by mental health conditions. Read about how panic attacks affect men here. If you think back to the last time you felt truly nervous, you may also recall feeling your anxiety in your stomach. High anxiety can definitely lead to an upset stomach in some people. But how does an upset stomach affect your level of anxiety?